I love The Wizard of Oz. Always have done. In many ways my journey is like Dorothy’s, with an escape to Oz, a magical journey filled with wonderful people and a return home. BUB.1 knows I love The Wizard of Oz. But he is only five. He plays with my ruby slipper necklace, he loses it down the back of the sofa or at the bottom of his toy boxes, and then it’s found. And around we go again. BUB.1 loves Lego. He would sit and create Lego buildings and vehicles all day if he could. 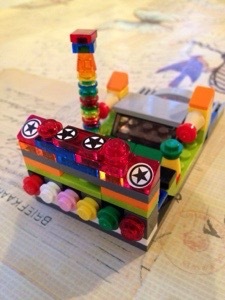 He’s made wonderful things for me like this disco boat. A disco boat! Who could ask for more? 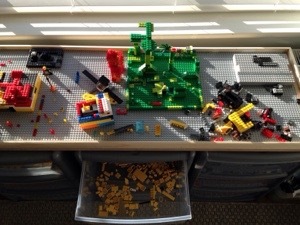 A few months ago, following a very out-of-character peruse of Pinterest, I made BUB.1 a Lego workstation, partly to keep the baby away from the endless Lego piles that he left around the house (it didn’t work). And partly because I thought he deserved somewhere to work, where he could build his jungles and his windmills and his disco boats and endless other things. Because I love him and seeing him happy makes me burst. 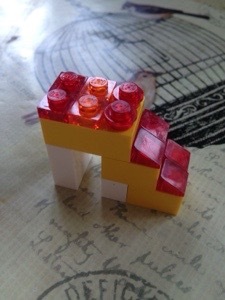 The other day he had lost my ruby slipper necklace for quite a while, a few days, and after a little quiet spell at his Lego desk, he presented me with my favourite Lego creation yet. One that told me that he loves me just as much as I love him. I LOVE this! 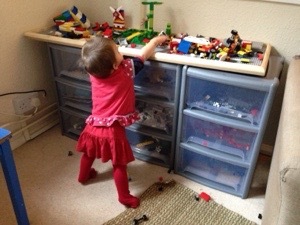 we are lego fans here, well the kids are I’m always stepping on the damn stuff – ouch! Aw that’s so lovely and I’m so impressed at his creative skills! It’s funny how our little ones rarely have much that they can give us, but the things that they do give can just blow us away.